It's lunchtime, so I made you some strawberry cucumber salad. Do you like a nice pomegranate vinaigrette? The sunflowers have really overstepped their bounds. Look at them! Our entire front garden is a wild tangled mess. A good mess! It's hard to snap photos while avoiding weeds, but don't you LOVE pinwheel petunias? See how this corner is changing? Hollyhocks come up any old place! They are growing right out of the rocks. We had to remove our big maple tree because we did not want it to fall on our dear neighbors' house! She won't give up though! Look at the little shoots! Maple trees remind me of fall and school starting. Do you press leaves into your fat books? I do. I feel sort of romantic when I look at Birdie and Miss Bug's school uniforms, little plaid skirts and khaki jumpers. I like football season (the idea of it, not the actual watching of games) and harvest doings. However, when I think of being gone from my house-nest for ten hours a day . . .
My friend Kerri (a fairy poet from New Zealand) sent me a most generous gift: Mr. Hare. I had admired him in her Etsy shop (Poetry and Cloth). Isn't he handsome? Hares are special you know. My dear sister, Karol, brought another reading gnome to me. With all the stuff she had to haul to Guemes Island, she brought me a goodie, too. She is very nice. You'd love her. Speaking of nice people, my Cambodian friend Christina and her little boy Nathan sent me this little mouse. Do you like his fancy outfit? He might marry Grace the mouse. They make a funny couple. She's all wooly and old fashioned and he's snazzy. I didn't take too many photos of the land of my youth, but the farms were stunning. They've had a lot of rain, too! The weather there has been like the weather in England. DAMP. This little string of cabins on Guemes Island is so charming. They are rustic, but very cozy. I think we could live in a lot smaller spaces than we do, don't you? Maybe we'd be forced to go outside more if our "digs" were cramped and small. My brother and his lovely wife stayed in the cabin they stay in every year, so before the flock of additional siblings arrived and before Bill had to fly back to Denver, we went to the beach for a sneak preview. Bill had fun talking to my mom and dad. Don't they look comfortable soaking up the sea view? I forgot to show you this photo of our boys. I took it a few weeks ago. Jeff is moving into an apartment this week (sad face for Mom) and Brad lives an hour and a half away. I do love my boys' twinkly eyes and happy smiles. They are good men. I spent yesterday on the sofa with a sore throat and a fever. I watched the Olympics and dozed. My doctor said that I probably caught this bug while on the airplane. I felt so horrible yesterday that in comparison, today I feel GREAT! So, the Year of the Toadstool: Summertime has rolled along so nicely. Friends pass toadstool views along to me (thank you, Katie!) and I have found a toadstool sister (Julie!) and gnomes and toadstools and fairies gather close by. Miss Bug and Birdie are "sleeping over" tomorrow night. We'll make fairy cakes and play with stickers. Sam comes Friday for an all-day stay with us. Yippee! 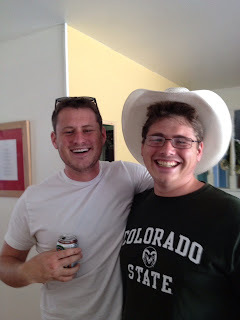 My sister-in-law is flying to Denver for a good visit and Monday is the third annual FINN'S Picnic! So, it's picnic food all around, splashes in the blow up pool, and family, family, family. Oh for heaven's sake. It IS still summer! Hooray! Oh, my coastal visit lived up to all expectations. With beauty in all directions, my eyes feasted on the pretty sights. Fresh crab from the sea bottoms tasted salty and felt tender. The round rocks and drift wood are so comfortable. The house my parents rented was very Northwest-ish and when it was full of brothers and sisters it was warm and friendly. Granddaughters played on the beach, threw rocks in the water, and felt the cool wind in their hair. My nephew has been a birder since he was a child. He records every bird he sees. I asked him about his bird journals and he let me look at his current log. Now I have an app on my phone and iPad called iBird Pro. John said that when you play the song a particular bird sings, they will come toward you. I'm going to try it out this morning. The app lists all North American birds and gives good information. Delightful! I have other new things to show soon. I am happy to be home planning my daily doings. A light dawned this morning when I was reading. When Jesus came, the people wanted Him to win justice and mercy for them because they felt oppressed by rulers and society, but Jesus said, "Turn the other cheek." They were confused. Jesus challenged them to GIVE justice and mercy. I do love to grasp new orders and as I think about going back to school and living in that society again, I find this instruction encouraging. I liked being with my nice parents and my friendly siblings. I liked seeing four of our granddaughters enjoy the sea air. I slept soundly in the atmosphere of my birth place and now I feel calm, tucked back into my spot here. Now I shall go outside and call some birds with my cell phone! Funny! Thank you for coming by! I missed my blog visits very much. You are a friendly group, too! Beth Carver paints the most beautiful swimming women. Gumbo Lily shared about her last year (or maybe the year before) and I've loved her paintings ever since! Yesterday, I tried on a big red swimsuit at a department store. What was I thinking? First of all, the dressing rooms were full (I should have heeded this warning and refrained from exposing myself to the monster mirrors inside). Nothing shakes one's confidence like swim suit truth. Seriously, I wanted to click my heels together three times and BE home. 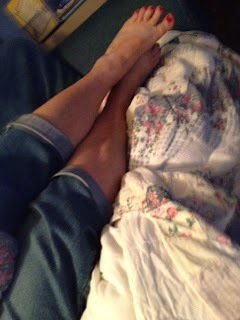 When I walked into our house I felt cozy relief and accepting love, that safety that comes when you are fully clothed. When you go shopping for clothing, do you feel suddenly attached to your own familiar garments? I do. They fit. I try on a few things and then take comfort in the clothes I had on, deciding that I like them more than I did a few moments ago. They give hope. I believe in school uniforms because they are a good equalizer and they tend to prevent a lot of "personal appearance angst" with girls especially. When I was at a Christian women's conference a few weeks ago, I noticed that everyone around my age had on capri pants, similar comfortable shoes and nondescript knit shirts or blouses. That's a uniform, isn't it? I've always thought nuns looked very pretty in their look alike outfits. Kelli invited me to join her for a manicure and pedicure today and I looked around at the feet near me. Old feet, young feet. All fairly unsightly because let's face it, cute feet are rare. But all this to say: I worry about dumb things. I need to get out more. My eyelid is healing up nicely, thank you! Fitting all my medical appointments in a two week period wasn't all that smart. I think I'm shyer than I thought I was. All the waiting room, blood drawing, breast screening (yikes!) and "filling out forms" business IS NOT FUN and made me nervous, very nervous. I know. Weird. One more appointment to go. The dermatologist. I like him. He is so speedy at removing unnecessary (ahem) things and for some reason I am not one bit shy about letting him check out the battle scars of aging all over my freckled skin. And there you have it. I have nothing more exciting to share than my boring old personal business. Thanks for reading. Hello July morning! You're cool! Yes, the attic fan is pumping in the cool morning air. The sun will soon beat down, so I'm welcoming the cold on my itchy face and arms. I am allergic to certain sunscreens and I even break out in hives when I hug people who are wearing sunscreen! I joined an art journaling site, so I am trying to create a page. Trying. Jeff's tomatoes are ripening and we ate a slice on our hamburgers last night. I need to quit eating hamburgers because other than exercise class, I've been immobile. Reading, knitting, napping, sitting at the movie (Brave) with Kelli and the girls. I also ate "too many handfuls to count" of licorice jelly beans yesterday and popcorn and Coke at the movies. I'm over fueling my sloth-like body. Yikes. But . . . I DO look pretty cute in my yellow tutu swimsuit, don't I? Yeah, about that tutu cover up that I promised and was too expensive to buy. Sorry about that. I hate the swimsuit I bought last year. It doesn't fit right and doesn't support. It's going in the "give away" bag. The other cute swimsuit I bought doesn't fit on top so Jenny has it and it looks darling on her pregnant body. Enough about swimsuits. Blech! I'm having a minor eye surgery today. I have a warty thing on my eyelid that I've had forever, but I am finally getting around to having it clipped off. I might have some bruising, the doctor said. I'm trying not to think about a sharp instrument messing around so close to my eye in a few hours. Anyway. Next week Bill and I will be here. My homeland. These are the foothills I saw every morning when I was a child. I will see my mama and my papa. I can't wait to lay eyes on them. They are beautiful. Look at my pink mother! Bill will leave to come back to Denver and I'll go on to a little island to spend some time with my parents and my two brothers and two sisters and their spouses. FUN! Kelli and Jenny are flying up with their families and staying nearby, so I can play on the rocky beach with four of our granddaughters. My brother will cook up crab, fresh from the sea. "I remember when I graduated college, we were asked to submit exactly how we wanted our names to appear on our diplomas, and I spelled my middle name (which is Lorraine) Low Rain, because the day before I had been reading W. S. Merwin's new book and in it was some kind of brief Japanese thing along the lines of "Low Rain, Roof Fell." That made me laugh! The original poem is thought provoking. You should look it up. What do you remember about your summer youth? I remember wearing jeans with elastic in the back and hooded grey sweatshirts. I remember feeling cross because my hands were sticky (I'm a compulsive hand washer even now which is why my hands look borderline witchy). I remember how an old quilt smelled as it cushioned me from the rocks on that same island beach. I remember relatives coming to share supper and I remember not really liking some of them. I remember walks down the beach on my tired little legs and wishing my mother would just carry me. I remember my protruding belly, snuggly covered by a stretchy polyester swimsuit. I remember patting that tummy and not minding that it was sticking out. I'm not packing a swimsuit for this visit, because remember, I'm giving it away. Smile. While you are thinking of childhood summer memories, here are some cosmos for you. It's cosmos time again. Gold finches and chickadees are zooming in for landings, looking glorious and tiny. Five weeks remain until I go back here. I've been reading through our new textbook, but that's as far as I've gotten with school year planning. Five weeks from now is an age away, right? Right. I'm off to take my lizard-y eyelid to the doctor. I might have to lay low for the rest of the day. More sluggish behavior. Thank you so much for reading to the bottom of this post. I'm smiling at you. Yesterday a friend and I visited a tea shop. 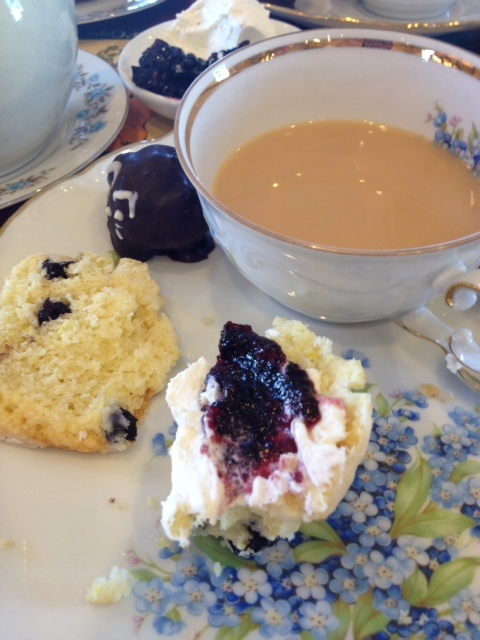 It was VERY quiet and the scones were delicious. Doesn't it look pretty? The truffle was a bit chocolatey and over the top, but I ate it anyway. Our oldest son called last night and wanted to talk about tea even though he didn't know I'd been out imbibing on tea and treats. He purchased Tetley Tea and he wanted to tell me. He also reminded me of some of the teas I bought when he lived at home. I'd forgotten about some of those tasty drinks! Lynn sent me some PG Tips tea and it is so far my favorite. So with tea things on my mind, I washed my little doll dishes. I did it for you, so we could look at some lovely photographs. Now, I must put it all away. I'm having one of those days when I don't quite know what I want to do. Judging by my appearance in the mirror, I'm really tired. If you are a mother you may remember a few trying times when your children were aimless and downright naughty. My mother always says, "Don't let your children get too tired or too hungry. You'll pay." Well, I have little patience with myself when I'm feeling restless and I forget that maybe I'm tired. Tiredness doesn't have to make sense, does it? If we had adequate sleep during the night and we've exercised regularly, we shouldn't be tired, right? Wrong. Sometimes our sleepiness is not predictable. So I am going to flop on the couch and read some Elizabeth Goudge, thank you! I never run out of things to show you. I'm glad! 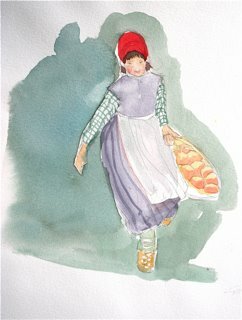 I found three new-to-me illustrations that I'd like to share. 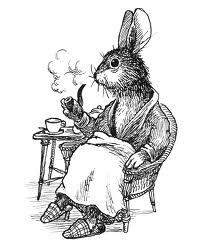 This is a lovely pipe smoking bunny by Garth Williams. One of my very favorite artists: Lisbeth Zwerger. This illustration is by Rob Hefferan. He also illustrated one of my favorite renditions of The Three Bears. 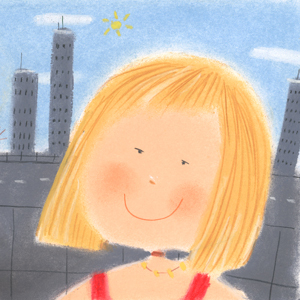 I hope your summer days hold a bit of rest. If I was your mother and I saw that you looked a little care-worn and limp, I'd say, "YOU are having a nap. I'll make sure it's quiet and when you wake up, there will be tea and treats." I'm glad you called in today!